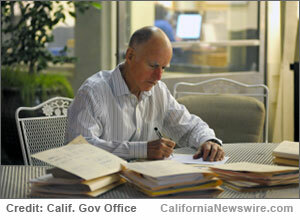 SACRAMENTO, Calif. /California Newswire/ — This week, Calif. Governor Edmund G. Brown Jr. announced the following appointments: First, Sandra Alfaro, 50, of Hanford, has been appointed associate director of high security institutions at the California Department of Corrections and Rehabilitation, where she has served as acting associate director of high security institutions since 2015. Alfaro served as warden at the North Kern State Prison from 2012 to 2015, chief deputy warden at the California Substance Abuse Treatment Facility and State Prison, Corcoran from 2011 to 2012 and associate warden at the Central California Women’s Facility from 2008 to 2011. She served in several positions at Avenal State Prison from 1988 to 2008, including acting associate warden, facility captain, lieutenant, counselor, sergeant and correctional officer. This position requires Senate confirmation and the compensation is $148,188. Alfaro is a Republican. Karla Crawford, 64, of Sacramento, has been reappointed to the California Volunteers Commission, where she has served since 2000. Crawford has served in several positions at the Sacramento County Department of Human Assistance since 1980, including program manager, director of the Foster Grandparent Program and eligibility worker. She is a member of the Sacramento County Department of Human Assistance’s Retired and Senior Volunteers Program Advisory Council, Senior Companions Program Advisory Council and the Foster Grandparent Program Advisory Council. Crawford was a California delegate at the White House Conference on Aging in 2005. This position does not require Senate confirmation and there is no compensation. Crawford is a Republican. Rita Holiday, 57, of San Jose, has been reappointed to the California Volunteers Commission, where she has served since 2008. Holiday has been community engagement manager at Intel since 1997. She was community engagement manager at PageNet from 1991 to 1997 and a branch manager at Olsten Professional Temporary Services from 1983 to 1991. This position does not require Senate confirmation and there is no compensation. Holiday is a Democrat. Henry Lozano, 67, of Long Beach, has been appointed to the California Volunteers Commission, where he has served since 2010. Lozano has been president and chief executive officer at the Deep Still Water Institute, California Youth to Youth Alliance since 2010. He was director of the Los Angeles County Teen Challenge and Urban Ministries Initiative from 2011 to 2014, executive director at the Shinnyo-en Foundation from 2009 to 2011, deputy assistant to the president and director at the USA Freedom Corps from 2007 to 2008 and president and chief executive officer at Californians for Drug Free Youth from 1996 to 2007. Lozano was founder and executive director at the California Youth to Youth Alliance from 1992 to 1995, executive director at the Santa Ynez Valley Network for Drug-free Youth from 1988 to 1992 and a drug counselor at the California Department of Mental Health, Drug Abuse Services Riverside from 1986 to 1988. He was executive director of the Riverside Teen Challenge from 1976 to 1986 and of Youth Awakening from 1974 to 1976. Lozano was a manager at the Steven Elmore Ranching Company from 1966 to 1974. He is an advocate and consultant for the Global Peace Foundation’s First Amendment National Campaign and Safe Haven Campaign. This position does not require Senate confirmation and there is no compensation. Lozano is a Republican. Kathryn Lynn McKim, 53, of El Dorado Hills, has been reappointed to the California Volunteers Commission, where she has served since 2014. McKim has held several positions at AT&T California since 1986, including vice president of external affairs, assistant vice president of operations for external affairs and assistant vice president of sales operations. McKim is chair of Teach for America, California Capital Valley and a member of the College Track Sacramento Advisory Board, California Women Lead, City Year Sacramento, Asian and Pacific Islander Scholarship Fund and the California Asian Chamber of Commerce. She earned a Master of Business Administration degree from the University of San Francisco. This position does not require Senate confirmation and there is no compensation. McKim is a Republican. Amanda Plasencia, 28, of Sacramento, has been reappointed to the California Volunteers Commission, where she has served since 2015. Plasencia has been a coordinator at Sacramento Charter High School since 2013. She was a science teacher for the Chelsea Public School District in Massachusetts from 2009 to 2012. Plasencia earned a Master of Education degree in prevention science and practice from the Harvard Graduate School of Education and a Master of Education degree in curriculum and instruction from Boston University. This position does not require Senate confirmation and there is no compensation. Plasencia is a Democrat. Lisa Spinali, 52, of San Francisco, has been appointed to the California Volunteers Commission, where she has served since 2007. Spinali has been an independent consultant at Lisa Spinali Consulting since 2011. She was executive director at the San Francisco Education Fund from 2009 to 2011 and at the San Francisco School Volunteers from 2005 to 2009. She was vice president for civic engagement at the Omidyar Foundation from 2002 to 2004, founder and managing partner at Ripple Effect Consulting from 1997 to 2002 and program director and senior consultant at the Presidio Leadership Center from 1995 to 1997. Spinali was senior manager for consumer card group marketing and travel related services at American Express from 1990 to 1994, an executive on loan at the White House in 1993 and a banking services officer at the Wells Fargo Bank, Credit Card Division from 1985 to 1988. Spinali earned a Master of Business Administration degree from Harvard Business School. This position does not require Senate confirmation and there is no compensation. Spinali is a Democrat. Tim Strauch, 49, of Huntington Beach, has been reappointed to the California Volunteers Commission, where he has served since 2015. Strauch has been vice president and chief operating officer at OneOC since 2009. He has held several positions at the YMCA of Orange County since 1991, including executive vice president, senior vice president, group vice president, executive director and senior health and fitness director. He earned a Master of Science degree in athletic administration from Florida State University. This position does not require Senate confirmation and there is no compensation. Strauch is a Republican. Daniel Torres, 42, of Sacramento, has been appointed director of immigrant integration in the Office of Governor Edmund G. Brown Jr. Torres has been chief of the Immigration Branch at the California Department of Social Services’ Welfare to Work Division since 2015. He was deputy director of programs and new initiatives at California Rural Legal Assistance Inc. from 2010 to 2015. Torres was an attorney at the Immigrant Legal Resource Center from 2008 to 2010, at the U.S. Court of Appeals for the Ninth Circuit from 2005 to 2008 and at the California Rural Legal Assistance Foundation from 2001 to 2005. He was a clinical instructor at the University of California, Davis School of Law Immigration Law Clinic from 2004 to 2005. Torres earned a Juris Doctor degree from the University of California, Davis School of Law. This position does not require senate confirmation and the compensation is $127,992. Torres is a Democrat. Carol Baker, 64, of Sacramento, has been appointed to the California Water Commission. Baker was chair of the California Fish and Wildlife Strategic Vision Blue Ribbon Citizen Commission in 2011 and an independent water policy consultant at Kaufman Campaign Consultants in 2009. She was chief policy consultant for natural resources and environmental protection policy and deputy budget director in the California State Assembly Speaker’s Office from 2000 to 2008. Baker was principal budget analyst at the California Department of Finance from 1994 to 2000 and from 1985 to 1992, where she was a staff budget analyst from 1982 to 1985. She was a deputy director for administration and management at the California Department of Housing and Community Development from 1992 to 1994. This position requires Senate confirmation and the compensation is $100 per diem. Baker is a Democrat. Andrew Ball, 62, of Piedmont, has been reappointed to the California Water Commission, where he has served since 2010. Ball has been western region president at Suffolk Construction since 2012. He was chief executive officer at Webcor Builders from 1994 to 2012 and president at AJ Ball Construction from 1992 to 1994. Ball was executive vice president at Koll Construction from 1986 to 1992, a partner at Davis Development from 1984 to 1986 and senior project manager at CL Peck Contractor from 1978 to 1984. This position requires Senate confirmation and the compensation is $100 per diem. Ball is a Republican. Rachelle Arizmendi, 43, of Sierra Madre, has been appointed to the State Interagency Coordinating Council on Early Intervention. Arizmendi has been vice president and chief operating officer at the Pacific Asian Consortium in Employment since 2016 and has served as a member of the Sierra Madre City Council since 2014. She was executive director at 2-1-1 California from 2014 to 2016, an adjunct professor at Pasadena City College from 2013 to 2015 and held several positions at the Pacific Asian Consortium in Employment from 1998 to 2014, including director and nutrition coordinator of the Early Childhood Education Program. Arizmendi was an independent consultant from 1998 to 2001 and a clinic supervisor at Northeast Valley Health from 1997 to 1998. She is a member of the League of California Cities. Arizmendi earned a Master of Science degree in family and consumer science from Eastern Illinois University. This position does not require Senate confirmation and there is no compensation. Arizmendi is registered without party preference. Olivia Sison, 17, of Sacramento, has been appointed to the California State Board of Education. Sison has been secretary of the Student Council at C.K. McClatchy High School since 2015, where she has been a student since 2013. She has held several positions at the Sacramento Youth Commission since 2014, including events coordinator and treasurer. She is a member of the California Scholarship Federation. Sison has been a ballet dancer since 2001, performing with the Sacramento Ballet and as a soloist with the Crockett-Deane Ballet Company. This position requires Senate confirmation and the compensation is $100 per diem. Sison is not registered to vote. Lisa Thong, 32, of Rosemead, has been appointed to the California Board of Barbering and Cosmetology. Thong has been account supervisor of public relations at IW Group Inc. since 2014. She was senior special assistant in the California State Controller’s Office from 2012 to 2014, an editorial assistant at HarperCollins Publishers from 2010 to 2011 and administrative director at the Center for Asian Americans United for Self Empowerment from 2008 to 2009. Thong was a field representative in the Office of California State Senator Jack Scott from 2006 to 2008 and development assistant at East West Players from 2004 to 2005. Thong is a member of the OCA-Asian Pacific American Advocates, Greater Los Angeles Chapter. This position requires Senate confirmation and the compensation is $100 per diem. Thong is registered without party preference. Norman Franklin, 50, of Sacramento, has been reappointed to the 52nd District Agricultural Association, Sacramento County Fair Board of Directors, where he has served since 2012. He has been a certified competent conveyance mechanic at Otis Elevator since 2007. Franklin was a certified competent conveyance mechanic at ThyssenKrupp Elevator from 2006 to 2007, at Kone Inc. from 2003 to 2005 and at Mitsubishi Electric America from 2000 to 2005. He is president of the Elk Grove Historical Society. This position does not require Senate confirmation and there is no compensation. Franklin is a Democrat. Despina Kiriakes, 29, of Sacramento, has been appointed to the 52nd District Agricultural Association, Sacramento County Fair Board of Directors. Kiriakes has been a consultant for Bride To Be Couture since 2015. She was an account executive at Moroch Partners in 2015 and held several positions with the Sacramento Kings from 2009 to 2015, including an inside sales representative, a guest information specialist and an experience center manager. This position does not require Senate confirmation and there is no compensation. Kiriakes is registered without party preference. Lizette Mata, 29, of Sacramento, has been appointed to the 52nd District Agricultural Association, Sacramento County Fair Board of Directors. Mata has served as deputy secretary of state for special projects in the California Secretary of State’s Office since 2016. She was director of policy and strategic planning for State Board of Equalization member Fiona Ma from 2015 to 2016 and director of special projects at the California Department of Motor Vehicles from 2013 to 2015. Mata served as director of communications in the Office of California State Senator Ricardo Lara from 2012 to 2013 and in the Office of California State Assembly Speaker pro Tempore Fiona Ma from 2011 to 2012. She was secretary of the California State Assembly Committee on Veterans Affairs in 2011 and served in several positions in the California State Assembly Speaker’s Office from 2008 to 2011, including press deputy and press aide. Mata is a member of the California Latino Capitol Association. This position does not require Senate confirmation and there is no compensation. Mata is a Democrat. James Perham, 56, of Elk Grove, has been appointed to the 52nd District Agricultural Association, Sacramento County Fair Board of Directors, where he has served since 2010. Perham has been owner at Perham Ranch since 1982 and vice chair of the Cosumnes Community Planning Advisory Council since 2004. He is a member of the Sacramento County Farm Bureau. This position does not require Senate confirmation and there is no compensation. Perham is a Republican. James Nachbaur, 36, of Washington, D.C., has been appointed assistant director of the Division of Recycling at the California Department of Resources, Recycling and Recovery. Nachbaur has been an energy industry analyst at the Federal Energy Regulatory Commission since 2014. He was a science and technology policy fellow in the American Association for the Advancement of Science Fellowship Program at the U.S. Department of Energy from 2012 to 2014, an economist at the California Legislative Analyst’s Office from 2009 to 2012 and a senior consultant for economics and transfer pricing at Ernst and Young LLP from 2008 to 2009. Nachbaur earned Doctor of Philosophy and Master of Arts degrees in economics from the University of California, Santa Barbara. This position does not require Senate confirmation and the compensation is $136,308. Nachbaur is registered without party preference. Glen Becerra, 48, of Simi Valley, has been appointed to the California Student Aid Commission, where he served from 1992 to 1993. Becerra has been deputy executive officer of communications at the Los Angeles County Metropolitan Transportation Authority since 2015 and a member of the Simi Valley City Council since 1998. He held several positions at Southern California Edison from 1996 to 2014, including local public affairs chief of staff and senior project manager. Becerra served as a legislative aide in the Office of California State Assemblymember James L. Brulte in 1996 and deputy director of external affairs in the Office of the Governor from 1993 to 1996. Becerra is a member of the California Lutheran University Board of Regents and served as a member of the White House Commission on Presidential Scholars from 2001 to 2010 and the California Council on Criminal Justice from 1999 to 2000. This position requires Senate confirmation and the compensation is $100 per diem. Becerra is a Republican.